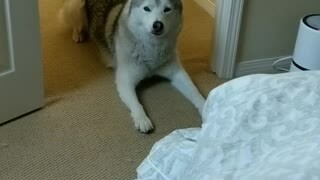 Rumble - Take a look at this Husky talking to his parents! 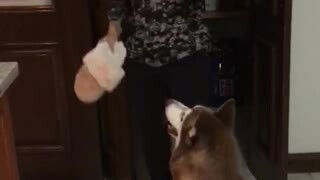 If you thought that only children were capable of making tantrums, after watching this video you will realize that you were very wrong, this Husky dog will surprise you with his actions and his guilty look. In general, most dogs try to do everything possible to avoid being reprimanded for their bad deeds, but this Husky in particular seems to have a special ability that allows him to get away with it, thus avoiding the corresponding punishments for his misconduct. Very funny! This Husky is called Blu and he is quite affectionate and charismatic, he always obeys his parents and does not cause problems at home, but when there is no one at home, Blu takes advantage to make a disaster, because he knows that there is not one person to control his behavior. Blu&apos;s orders were to go to bed while his parents had an appointment outside the house, Blu just had to rest and wait for his parents to return, but it seems that he did not like the idea of staying alone at home while his parents had a date, that&apos;s why he destroyed the bed where he was supposed to sleep. When Blu&apos;s parents returned home, what they found were just the remains of what was once a beautiful, soft dog bed and they knew exactly who to blame. Blue knew that he was guilty of this crime and did everything possible to explain what happened, simply with a little extra tantrum, he tried to evade the problems with some excuses. 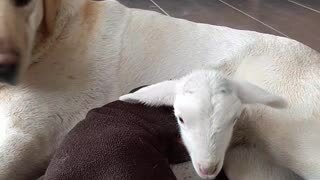 Blu knew that mom was angry and knew that his misbehavior would bring consequences, so he cried and howled as loudly as he could, talking about mom&apos;s accusations and lowering his head to avoid eye contact. Blu is very smart! Husky dogs have captured the attention of people for many years, as they have an elegant and imposing appearance, and their impressive talent can surprise anyone. 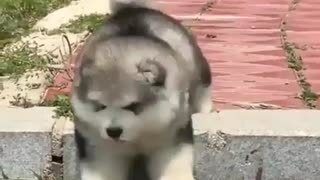 This dog has an athletic body and many people say that the Husky are able to feel real emotions like guilt and remorse. Most dogs do strange things when they are alone at home, sometimes cause many problems, it is likely that this happens when dogs are used to being with their parents, so when they are alone at home they feel alone and look for alternatives to have fun. Blu it is a clear sign that dogs do not like to be alone at home! Dogs &apos;bad behavior usually has a reasonable explanation, they often behave like children, dogs love to explore and do tricks to get their owners&apos; attention and tell them when they are or not according to their orders and decisions. It is advisable not to hit the dogs when they do inappropriate things, since that makes the dog feel sad and hated, that is not good for anyone, the dogs are intelligent, so you just have to educate them correctly. Dogs are children with tails and four legs! Siberian Huskies have captured the imagination of the masses, as well as artists, writers, and film producers, with their eye-catching looks and awe-inspiring talents. The medium-size working dog called Blu, possesses power and athleticism and he also feels guilt and remorse. Blu is a sweet boy that only acts up when no one is present. In this video, he was told to go to bed and be a good boy while mom and dad went on a date. Apparently, Blu wasn&apos;t ready for bed ... so he ate it. When the parents came home, what they found was only the remnants of what was once a gorgeous, fluffy dog bed and they knew exactly who to blame. 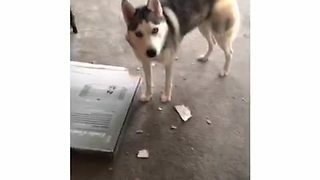 Blue knew he was guilty of this crime and he did his best to explain what happened - in typical husky fashion, just with a little extra tantrum on the side! 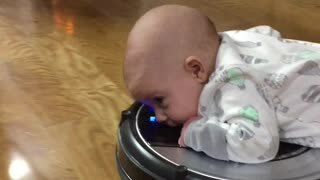 He knows mom is angry and will reprimand him heavily for it, so Blue did what he knows best - he cried and howled as loud as he can, talking over mom’s accusations and lowering his head to avoid eye contact. 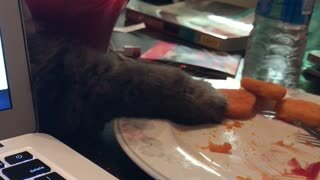 Blu&apos;s behavior is hilarious! The Husky was behaving like a child when they hear something they don&apos;t like. You know, that whole ordeal where they plug their ears and make noise, saying that they can&apos;t hear you. 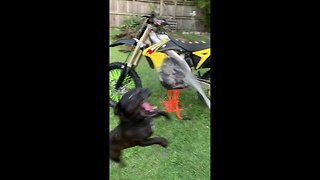 This hilarious reaction is something of unusual nature for dogs! 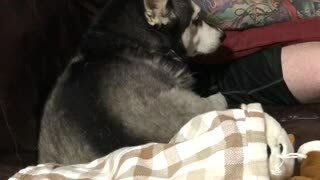 Check out this husky talking back to his parents!